See the beauty of Costa Adeje from above by going on a thrilling paragliding tandem flight. You won’t have to worry if you’ve never been paragliding before as all safety equipment is provided, and the experience is suitable for beginners. Get access to incredible panoramic views that you wouldn’t see otherwise, including Tejina mountain, and Barranco del Infierno. 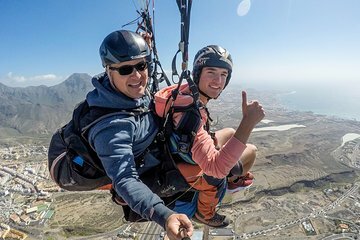 On paragliding flights, the mountain temperature prevails, so dress in comfortable clothes and bring a sweater or jacket in case it is cool. It is essential to come with sports shoes. Do you recommended taking anti-seasick medication? The paragliding flight is normally very stable and the passengers do not feel any adversity or dizziness. However some days, to stay longer in flight, it is necessary to make turns that allow us to stay inside the thermals. If you are excessively prone to seasickness, you can take the medication you would take if you were traveling by car.